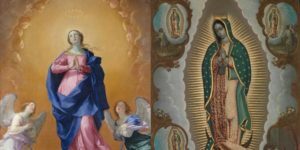 The Mass of the Americas, an intertwined tribute to Our Lady of Guadalupe (patroness of Mexico and all the Americas) and Our Lady of the Immaculate Conception (patroness of the United States) is going on an international Marian unity tour. First stop: Tijuana. 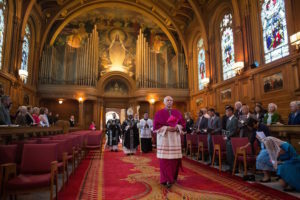 Have brunch on Mother’s Day then bring Mom and the family to sing to Our Mother: A prayer service (not a concert) featuring gorgeous hymns you can sing and gorgeous hymns the Benedict XVI schola sings. 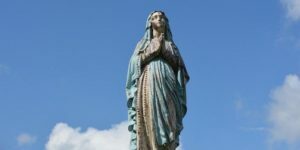 Each November, the Church honors first all her saints, and then asks us to pray for all the dead souls. This is a great chance to honor and pray for your own beloved dead. 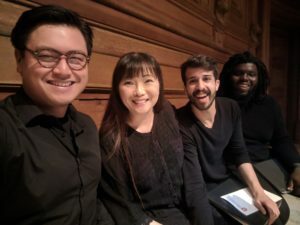 In the greater Bay Area, music director Rebekah Wu and her talented singers will come to your parish and teach your choir and congregation how to chant beautifully together. The first people who asked for our help was the San Quentin Catholic chaplain. Now we have a San Quentin Schola singing a Latin mass once a quarter. Our second gig was with the Missionaries of Charity who asked for our help to sing litanies for their feast days, to help teach chant to the children in their after school programs, and to assist them in singing for the Mass for the Homeless Deceased. Then the requests from ordinary parishes in San Francisco and Oakland started pouring in, from Star of the Sea to St. Ignatius. We work in both forms, on request, but mostly in the ordinary form, in ordinary parishes like yours. 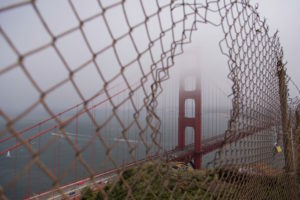 Email wongr@sfarch.org if you want to know more or get started. 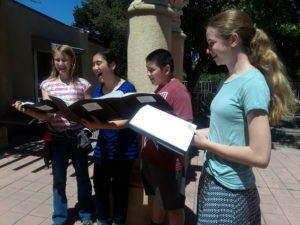 Children and teens love to learn to sing the Mass and we can help you make it happen! Pastors, Parents, Principals, Music Directors, or Teachers who wish to learn how we can help you sponsor a chant camp or Music Directors or Musicians who would like training to conduct chant camps of their own can sign up here. When the Catholic chaplain asked us to give a sacred music concert at San Quentin prison, we said yes. Then we asked the men if they’d like to form a Latin Mass schola: 35 said yes. Praise God! 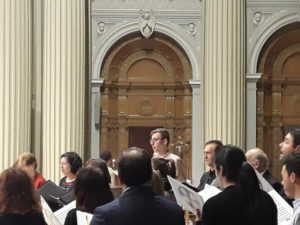 Our Teaching Choir director Rebekah Wu also conducts the Benedict XVI Schola and four-voice SATB choir that assists at Mass at liturgies Archbishop Cordileone performs. 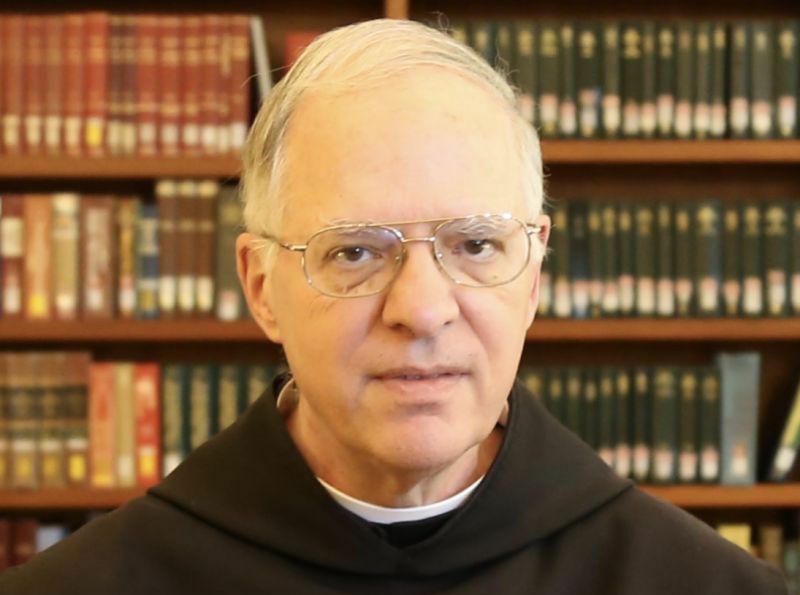 From the Ignatius Pew Missal to the Propers of the Mass and beyond, Gregorian chant composer and St. Patrick’s seminary professor Father Samuel Weber can help your choir or your parish chant the Mass.